70+ New Supporters for TACC! 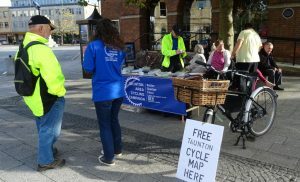 On Taunton Farmer’s Market Day, Thursday 12th October, members of the TACC Communications Committee held another ‘sign up TACC supporters’ campaign. After a tricky start, when we were moved on from the pitch photographed above to a spot outside Monsoon which actually proved advantageous, we had a steady flow of interest throughout the day. Without exception people were very interested in TACC’s aims and were very willing to become supporters. We also took the opportunity to raise the Firepool ‘Boulevard’ Taunton railway station to the town centre proposal which currently has no provision for cyclists and again people were very keen to express their concerns by signing the petition. All in all a very successful day with over 70 new TACC supporters signed up … still some way to go before our goal of 500 supporters is reached so please explain our aims and continue to sign up new supporters whenever you can.